Additionally, our law office delivers defense for traditional criminal cases such as drug offenses, sexual assault, homicide, weapons charges and internet crimes. With a deep understanding of the justice system from both sides, we are able to anticipate and rebut arguments presented by the prosecution. Partner Michael Bachner has earned the recognition of the American College of Trial Lawyers, Super Lawyers and National Trial Lawyers: Top 100. He also is AV Preeminent peer review and judicial rated,* the highest rating, through Martindale-Hubbell. Whether through arbitration or litigation with the SEC, FINRA or the CFTC, our law office also takes on securities cases for both plaintiffs and defendants. Mr. Bachner was previously an in-house lawyer for member brokerage firms of the New York Stock Exchange, where he garnered experience in the securities industry. We put this unique insight to work for clients, no matter what their situations entail. 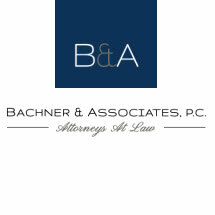 Bachner & Associates, P.C., takes cases across the greater New York City metropolitan area. We offer a free initial consultation and accept credit cards as payment.